Conceptualist and sonic theoretician Cluett debuts with a deep resonating masterwork. A full immersion experience that dissolves time. "My Own Thousand Shatterings is a one hour and fifteen minute composition consisting of three sections. It is a document of my obsession with rain, though it may not be immediately apparent as to how. I love how rain varies infinitely, how the totality of it is a drone, how (much like white-noise) when it reverberates in our architecture, it pulls pitches out of the air. I love how thunder dwarfs the sound of everything for a moment, and how its sustained echo rolls spatially around us. The third piece is a stereo field recording, the second is a stereo documentation of a performance, the first was recorded in a studio to a mono reel-to-reel. The pitches for the first and second pieces came mostly from the rain of the third piece being played back in the resonance of my home, the speed of change in the first two pieces comes from my obsession with geological data about the Kutiah glacial surge that happened in Pakistan where a glacier decided to move twelve kilometers in two months. That is a very fast slow. The second piece is paced in performance by my memory of the data, the first piece is paced by my memory of the pace of the performance of the second piece. The combined pitches that came about by improvising with the frequencies originating in the field recording were then used to gently filter the field recording itself in the third piece." 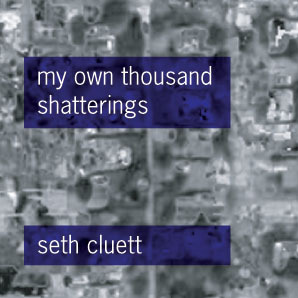 Seth Cluett (b. 1976, Troy, NY) is an artist, performer, and composer whose work ranges from photography, and drawing to video, sound installation, concert music, and critical writing. Engaging the boundary between the auditory and other senses, his work is marked by a detailed attention to perception and to sound's role in the creation of a sense of place and the experience of time. The apparent tranquility of Cluett's work - at once gentle and un-nerving - is concerned with the rapidly shifting sensory landscape of technological development and urbanization. Cluett uses minimal materials derived from close listening and observation of the environment to point up the way in which we personalize our objects and actions. Through creative mis-use of post-consumer goods, adaptive re-use of raw architectural elements, and a nostalgic obsession with dead technologies, these materials become instrumentalized. In this way, many of his pieces investigate the movement, patterns, and social organization of both work and play, while others explore the acoustic signature of specific locations, where sound is exposed as the result or goal of a social activity, a characteristic of architectural space, or a by-product of a geological process. Cluett's work has been shown and/or performed internationally at institutions and festivals such as Kill Your Timid Notion at Dundee Contemporary Arts in Scotland; the 10th Rencontres Internationales, Palais de Tokyo Museum,Â and GRM in Paris; Hebbel am Ufer Theater in Berlin; the Osage Art Foundation in Hong Kong; The Kitchen, WPS1/MoMA, Issue Project Room, Roulette/Location One, Experimental Intermedia, and Diapason Gallery in New York; the Institute for Contemporary Art, Studio Soto, and Mobius Artist Space in Boston; the Betty Rymer, Heaven, Artemisia, and Deadtech Galleries in Chicago; and the Deep Listening Space in Kingston, NY. He has created dance and theater works with DD Dorvillier/Human Future Dance Corp, Helene Lesterin/Atlas Dance, and Jen Mesch. His work is documented on Errant Bodies Press, Radical Matters, Sedimental, Crank Satori, BoxMedia, Stasisfield, Winds Measure, and Wavelet Records. He has published articles for BYPASS, Shifter, The Open Space Magazine, Leonardo Music Journal, 306090, Earshot, and the Journal of the Acoustical Society of America. the first two are based on the field recordings of the third piece. going into an even more minimal and microscopic level of sound. heaviness given the illusion of speed by the layering of purer sounding tones in slowly climactic modulation.